Diane Bemis pauses for a moment to collect herself. “I get emotional,” she says. The kind of “emotional” that bubbles up from one’s core; a wave of fulfillment triggered by an attachment to something deeply impactful. “When I come to the barn, everything else drops out of my mind. The horses make you be there in the present moment, and you see the magic they do with the students,” Diane says. 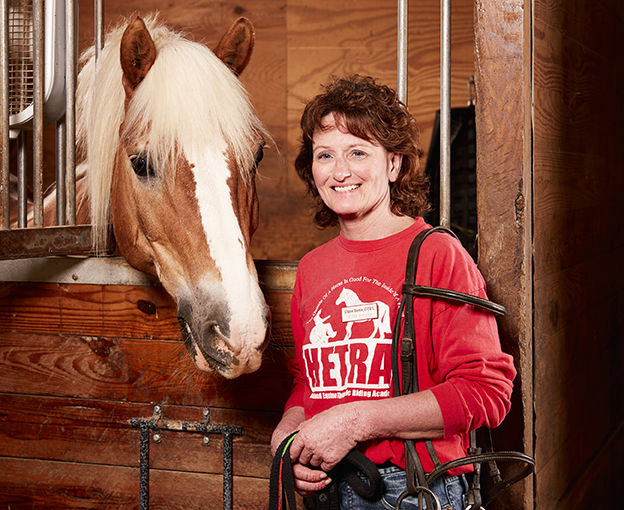 Since 2006, Diane has worked as an occupational therapist with Heartland Equine Therapeutic Riding Academy (HETRA), an almost 30-year-old endeavor that harnesses the power of equine-assisted activities to improve the physical, emotional and social lives of adults and children with disabilities. Each week, 125 participants leave behind wheelchairs, crutches and canes to saddle up on any of 18 therapy horses and take strides they would not be able to take on their own. “What’s really cool – it’s so much therapeutic value all wrapped up in one environment with the integration of sensory stimuli: vision, vestibular, hearing, touching and dynamic movement between horse and rider. That’s all happening at the same time, which is a blockbuster for the brain. So, you can make a big impact in a 30-minute session,” Diane says. HETRA offerings include a therapeutic riding program, sponsored in part by a Blue Cross and Blue Shield grant, that teaches riding skills, as well as a hippotherapy program that uses the horse as a modality to improve balance, bilateral coordination, core strength and motor control. “The way a horse’s pelvis moves is similar to how a human’s pelvis moves. So, the horse’s movement is getting into the person’s nervous system. They’re learning the normal way for the pelvis to move, and it can improve their own walking,” Diane explains. She began her involvement with HETRA more than 10 years ago, consulting as a volunteer and doing the things other HETRA volunteers do: cleaning stalls, sweeping barn aisles, leading or walking alongside horse and rider. As time passed – and she became more and more enamored with the organization – her role expanded as well. Diane now balances her therapy work at Snyder Charleson Therapy Services with two days a week as an OT at the HETRA complex in Gretna, Nebraska. She has completed American Hippotherapy Level 1 and 2 courses and is a certified instructor with the Professional Association of Therapeutic Horsemanship International. 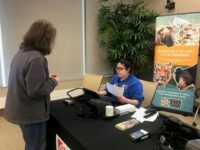 A Coast Guard veteran, Diane has galloped into program development, helping to launch HETRA’s Equine Services for Veterans. She has even recruited a new four-legged friend to assist. “Faces of Fearless” is a storytelling series in Blue Cross and Blue Shield of Nebraska’s “Live Fearless” campaign celebrating people living their very best lives and inspiring others to do the same. In partnership with the Omaha World-Herald.